There was a fabulous exhibition in the Louvre. Antiquity rediscovered, Innovation and restistance in the 18th century. Newly excavated archeological vestiges in Pompeï and Herculanum in the 1720–30s fueled debate in European academies and intellectual circles. All artistic fields were caught up in the dream of renewal through the classical. While eighteenth-century art is often perceived as a progressive move from a taste for the lightness of rococo to the grandeur of classical style, this exhibition sheds light on the different experiments undertaken to regenerate artistic forms and themes. Here are my favourite works among those featured in this exhibition. 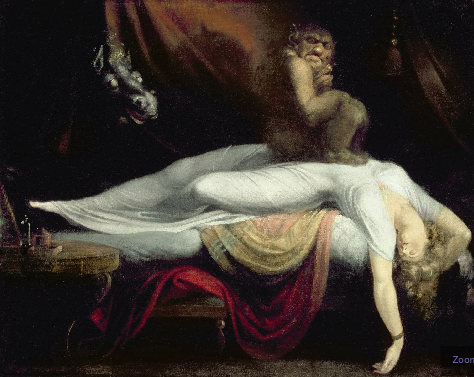 Although the young Woman is lying on a bed dressed in virginal white, the sleeping (or swooning) beauty is tormented in her sleep by a little demon who crouches heavily on her belly. That is the mara, spirit or hag, who gives its name to the painting, because "nightmare" originally meant not a bad dream, but an incubus. According to a marginal Christian belief in the late Middle Ages, an incubus was a spirit that came to trouble women's dreams with its sexual ardor. 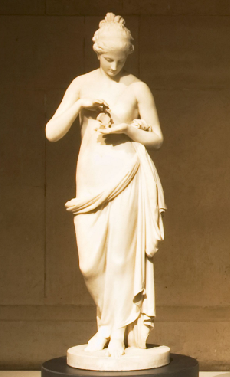 Psyche has just been abandoned by Cupid, the God of Love, who was furious at his wife's betrayal: she had broken her promise not to set eyes upon Cupid, who had to remain unseen. 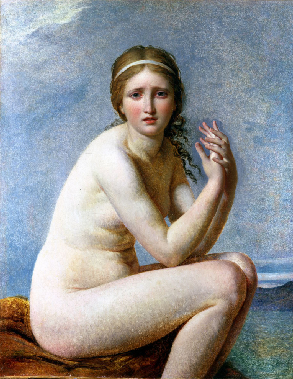 Psyche's graceful silhouette, painted against a pale ground, gains a more diaphanous transparency and an air of evanescence. This marble is delicate and gracious from every point of view. The young heroin is gazing at a butterfly as though meditating upon her own soul.